Brian Kanable of La Crosse, Wisconsin, could just as easily have been mowing his lawn or taking a walk with his wife, Julie, on the morning in late August when he had his heart attack. But he wasn't. The 53-year-old was waterskiing. As a result, Brian not only suffered life-threatening cardiac arrest, he also nearly drowned. Fortunately for Brian, a host of factors came together to save him. 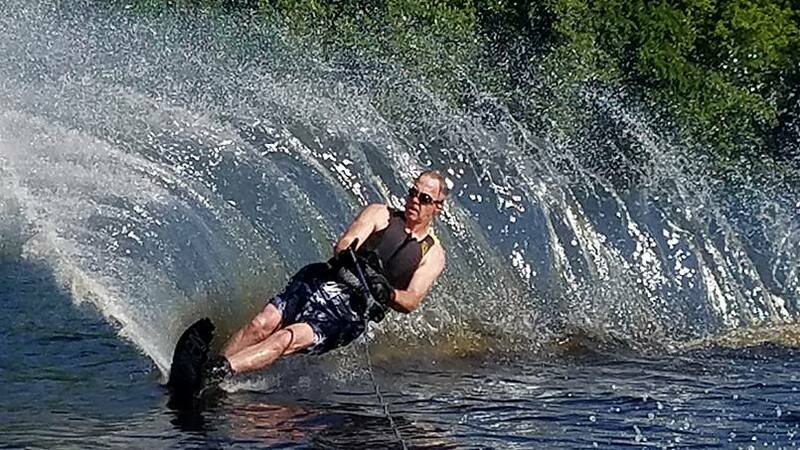 The quick thinking of his waterskiing buddies, the life-saving measures of emergency responders, and the expertise of his care team at Mayo Clinic Health System – Franciscan Healthcare in La Crosse all helped him survive the dual traumas he suffered that day. "The thing that was remarkable about Brian's success was that it was a fantastic interplay with all of the people involved," says Brian's cardiologist Charles Cagin, D.O. "It's a demonstration of what happens when everyone from the community all the way through the hospital does their job the way they're supposed to." Just a few months after the incident, Brian is not only back on his feet, he's amped up and eager to get back on his skis. "I'm going back to the life I was in the day before my heart attack, and it's hopefully better because I have a new heart now," Brian says. But after his experience that day, he says he won't "take life for granted." It was a typical August day when Brian and two long-time waterskiing friends took to the Black River north of La Crosse for an early morning ski. For years, the men had been meeting three to five days a week before work in the summer to ski the river. "It's fun getting together. It's a tremendous workout," Brian says. "It's a neat experience to ski at that time in the morning because you actually see the sun coming up." Brian was the first to ski. He jumped in, grabbed the ski rope, and was quickly up and skimming the water. He hadn't gone far when, according to his friends, his face began to change, and he unexpectedly let go of the rope. Brian was wearing a life vest. But as he sunk into the water, his body leaned forward and his face went underwater. His friends immediately turned the boat around and got back to Brian. One jumped in and began supporting Brian's head. He also grabbed the tow rope. The other drew the rope, along with the two men, back toward the boat, and they hauled Brian onboard. The men, who always carried a phone with them on the boat, called 911 and raced toward the marina where the emergency dispatcher directed them. "One thing we've always been is safety-conscious, which is quite honestly why I think I am alive," Brian says. The ambulance was waiting when they arrived at the marina. First responders started chest compressions immediately. Brian received four rounds of defibrillation before his heart began beating on its own again. "They literally revived me, lost me and brought me back," Brian says. "They worked on me for about 25 minutes before they could transport me back to Mayo." At Mayo Clinic Health System, physicians in Emergency Medicine quickly assessed Brian and the damage caused by his heart attack and near-drowning. "He had multi-system organ failure," Dr. Cagin says. In addition to his heart, Brian's lungs and kidneys had stopped functioning after he was pulled from the river. Brian's brain was deprived of oxygen for a brief time, which caused some issues with Brian’s memory and his ability to think clearly during his month-long recovery. 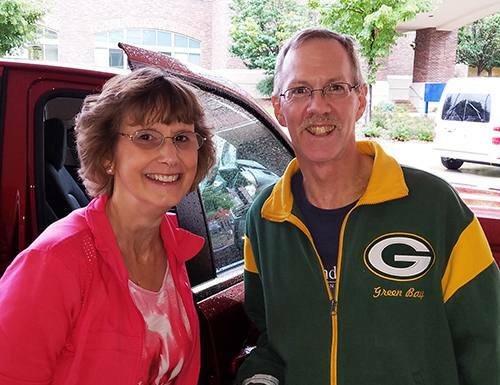 After Brian was stabilized, he was taken to the Catheter Lab, where five stents were placed in the coronary blockages that had led to his heart attack. From there he was transferred to the Critical Care Unit, where he spent the next 16 days. During that time, he was put on continuous renal replacement therapy, a temporary form of kidney dialysis, and placed in a medically induced coma. About six days after his heart attack, Brian started to make small movements and opened his eyes. A week later, with Brian experiencing more chest pains, his team implanted five additional stents to improve blood flow through his vessels. "Brian had multiple-vessel coronary disease, so you open up the ones that have acutely closed, and even though other ones are narrow, you don't put those vessels in jeopardy," Dr. Cagin says. He notes that the stenting process carries risk of vessel tearing or dissection. "That's the reason you stage it. It's a decision made at the time." After the second round of stents, more of Brian's functions returned. His memory began to come back, but most of the days he spent in the ICU are lost to him. "It's like I went into a long dream. From the time I had the heart attack, I was out of it for two solid weeks," Brian says. "My first recollection of coming around was basically squeezing hands, asking for a cold drink of water, and giving people hugs." When Brian was transferred out of the ICU at day 17, he began a rigorous regimen of physical therapy and cognitive speech therapy. Every step along his way to recovery, Brian says he was met with energetic staff eager to help him. "I felt like there was nobody there that didn't do a good job and wasn't pleasant," he says. "It felt like they were there because they love their jobs. I don't know if you get that in every hospital. The care is just awesome." Brian says his providers not only showed great care to him, but to his wife, Julie, as well. "The whole entire complex is like a family," Brian says. "No matter where we went, every day they were supportive of her and making sure she was taken care of. My wife would say, too, of the whole Mayo program, the bottom line is they really do care." Read more about heart attacks.